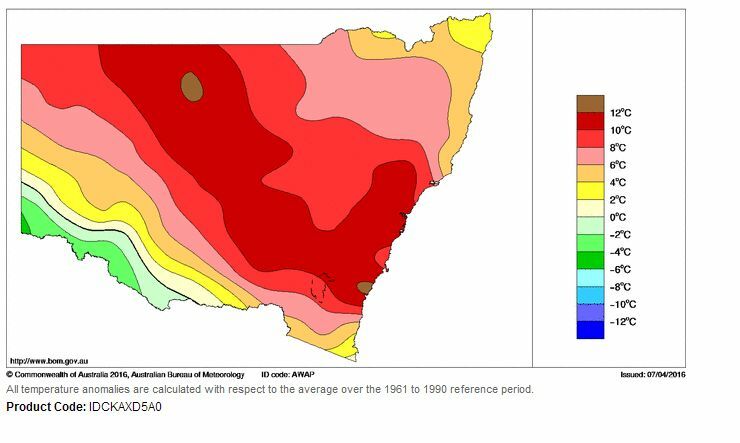 I have been looking at temperatures for GFS and the previous predecessor AVN for many years and I don't think I have seen NSW with such heat forecast and so widespread like this. I have seen 42C isotherms but 45C? Wow! It is going to be a hot one today and there will be storms in some areas where the cap can be broken. Inland the bases are going to be ridiculously high! I would not be surprised to see temperatures in the 46 to 48C range again today! 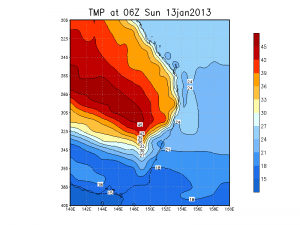 Can anyone recall 45C temperatures in NSW being so widespread on the isotherm maps of GFS? Wow, not me. 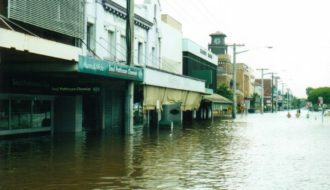 Sydney certainly had the potential for record breaking temperatures. Talking of storms, folks got smashed by something they've not seen in a long time between Gloucester, Wingham and Taree yesterday. Extremely strong winds, hail etc. Unfortunately it past just west of me and I didn't have the fuel money to chase. Its a state of two halfs. 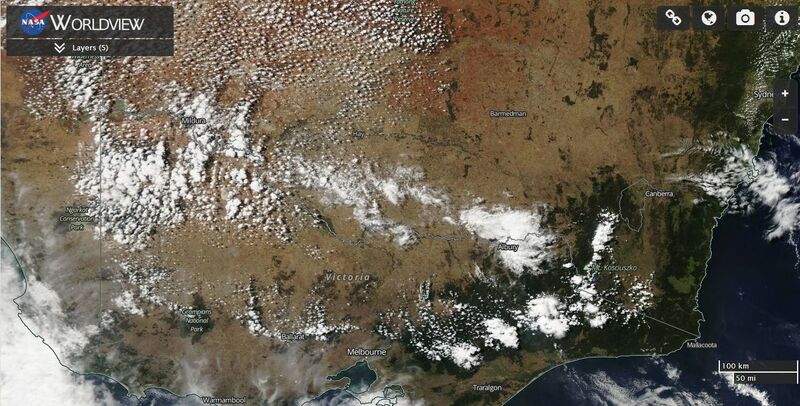 The southern half is quite cool due to a cloud mass and very light patchy rain. It only reached a little over 19C at Yarrawonga. Yet a few days ago, it reached 45.7C there. What a contrast. 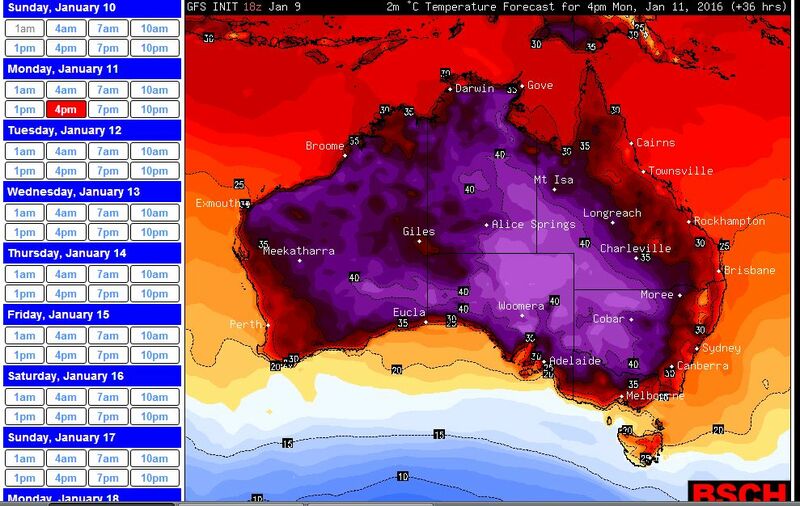 While at the same time, the heat has been pushed into northern NSW. Casino has enjoyed 38.4C. Bathurst has reached 37.8C. Sydney city reached just over 24C (Amazing). Trangie has reached 43.8C, Walget has reached 47.6C and Walgett has reached 47.7C. I could tell the heat would push into northern NSW while the southern half has enjoyed a welcome reprieve. Further to my first post via Facebook, I have gone looking for the highest temperatures for Sunday 13 January across Australia. It appears that the township of Thargominda in Queensland’s Channel country will take the honours as the nations hottest town today. A temperature of 48.5C has been recorded here today which is one of the highest during this current heat episode. 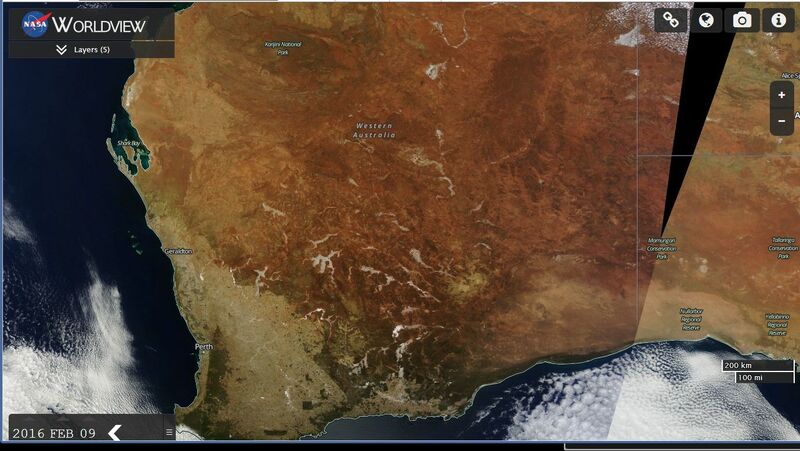 The heat has pushed well into inland Queensland as well and far north east South Australia. Any locality outside the influence of the cool change has experienced a hot day. 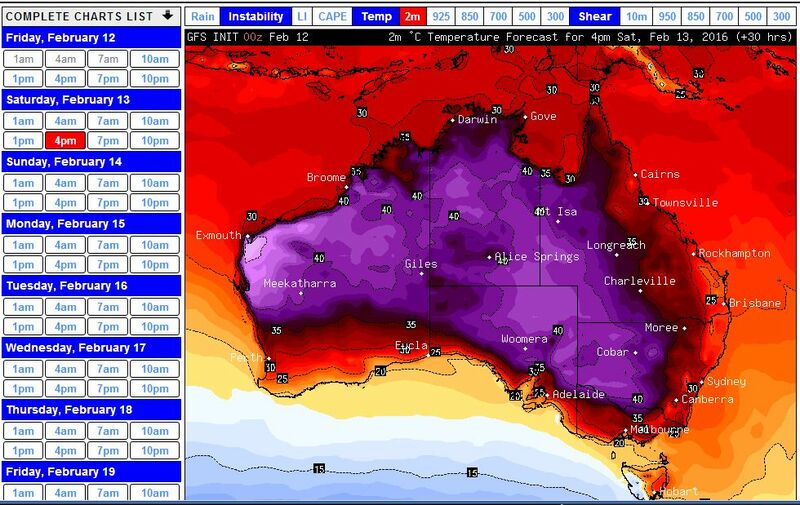 I alluded to this in “Catastrophic Bushfires and heatwaves Central and Eastern Australia” where the temperature Access Model plot for Sunday did show the heat pushing north giving the southern areas a reprieve. Walgett and Bourke are likely to share the honours as the hottest towns in New South Wales with 47.6C and 47.7C. Looking further Coonamble comes close on 46.4C and Trangie on 43.8C. Todays maximum temperature of 48.5C at Thargomindah (Queensland) is interesting as it appears to be the second highest temperature that I have found so far this January across Australia following the 49C at Leonora (WA) earlier this month. This compares well to the 48.4C recorded at Maree (South Australia) on the 5 and 8 January being the third highest that I can find. While hot, that 49C and 50C has still not been broken anywhere. Talking about the storms for this event. A small thunderstorm has just passed over Blacktown where I reside dropping probably at least 2 to 3 mm of rain. No photos as I could not even see the base due to the low coastal cloud obscuring the storm cell. Raindrops were quite large but they were not cold. This shows the contrasts that are occurring around the state of New South Wales at the current time. Further to my first posts, some updated temperatures are provided as the days maximum temperatures have now been recorded. Birdsville Queensland:- I saw on a Weatherzone newstorey 13/1/2013 where it is stated that 49C was reached for Sunday so I investigated this. The weather station shows 47.7C at 3.30 pm and 47.5C at 4 pm. A maximum of 49C appears to have occurred at 3.43 pm which is recorded in the “Maximum Temp” column. So did the temperature rise another 1.3C in 13 minutes after 3.30 pm only to drop 1.5C in 17 minutes by 4 pm to have this recording as the standard 30 minute recordings taken at 3 pm, 3.30pm and 4 pm do not suggest that this would have occurred. Thargomindah Queensland:- The maximum appears to have reached 48.8C. Windorah Queensland:- The weather station suggests a maximum of 48.8C at 2.43 pm. Bourke (NW New South Wales:- It is suggested that 48C has been reached but when looking at the official weather station 30 minute recordings, the figures are 47.7C at 3.30 pm and 47.6C at 4 pm being the peak for the day. The difference is 0.3C to 0.4C and it seems to be reasonable during this period. Gunnedah New South Wales:- Not as hot as Bourke. It reached 41.7C at 2.25 pm however by 5.30 pm, that had fallen sharply to just 30.2C as a cool change passed through bringing some storms to the area. At last checking this had brought significant wind gusts of up to 82 km/h and other gusts to 80 km/h as the wind change passed through. Here at Blacktown, two thunderstorms passed over. The first one, I mentioned above. The second one was much stronger and brought sustained thunderclaps including two very close sharp ones. I was unable to take any photos because the low cloud coming in from the south east and coast all but hid the actual storm cell. I never got to see what was going on above that low coastal cloud decking and I saw no structure. The only clue of it was the darkening of that coastal low cloud as it passed over. I saw one lightning flash being a cloud to ground strike which was very close but there were many more that I could not see. 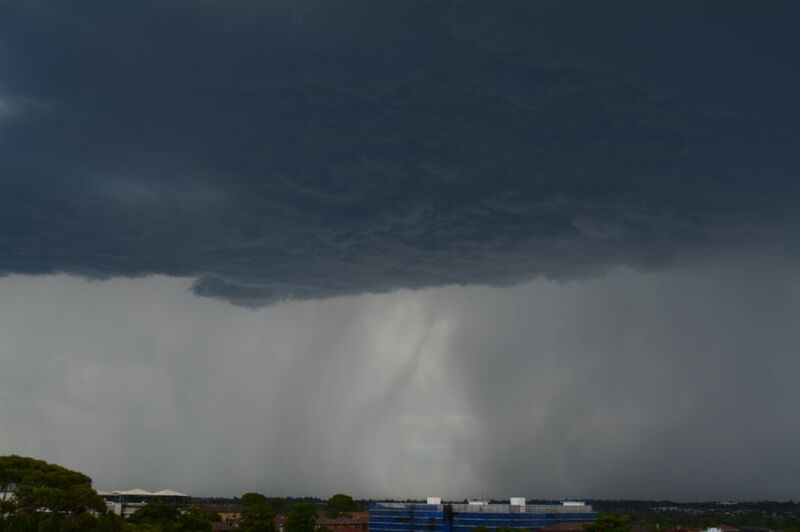 This brought a heavy rain shower with 4 to 8 mm but 8 to 16 mm across northern parts of Sydney. All I have as a record of it is the radar image at the time. Glen O'Riley what size hail? Incredible to see heat of this intensity in areas I have chased in the past! Will try and ask for you. I got told later today that they were without power most of the night due to high winds bringing down trees all around them, a friend up the road lost a shed as well. On a happier note, today's storm was closer to us with a strike RATHER close to us here (could only hear the crack without the boom) so things are looking up. Here are the “Water and the Land” Temperature plots for maximum temperatures for Sunday showing where the extreme heat occurred. Of interest is the area of dark brown over northern NSW, inland Queensland, north east South Australia and large areas of southern Northern Territory. A large area had maximum temperatures over 45C. 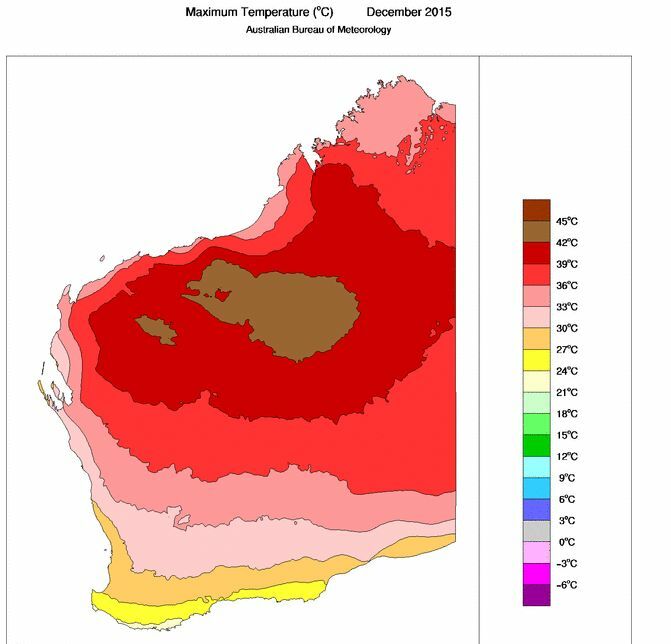 I have had a recent look at a BOM statement concerning the 48C and 49C extremes and this current heatwave and some appear to require verification. I also add the maximum temperature anomaly plot for the same period. Of interest is the area coloured brown over northern inland New South Wales and southern Queensland where the maximum anomalies were at least 12C above the averages. This extreme heat ended for some areas late Sunday with storms and I am aware of places around Narrabri / Gunnedah region (NW Slopes of New South Wales) having wind gusts to 126 and 128 km/h respectively. There have been news storeys in the Northern Daily Leader – Tamworth regarding storm damage from these high winds. So one extreme event ‘Heat and heatwave” has been compounded with another event being storms and the winds that they produced. The highest peak wind gusts appeared to have been around 128 km/h. Here is the lightning map for that storm. There were 578 lightning strikes from the storms for the day across Sydney with a concentration around NW Sydney. Yes that’ll be right – Colon and I were near Penrith entourage to Colo Heights when this barrage occurred! Well it was for a consolidated cell which also ppt diced some lightning but not as much as the region near Penrith. Thanks for posting the lightning map Harley.